Spinit Casino Review 2019 | Is This Online Casino Worth It? With a name like ‘Spinit’, it is pretty clear that this particular casino is all about the slot games. This is a new casino, only in operation since 2015, but it is clear that they intend to spin a few heads in the online gambling world. Visually this site really pops, and it is clear that this is a modern and fun loving casino. Reds and pinks and yellows are the dominant colors, and fun characters from popular slots appear around the site. While the slot games dominate, there are plenty of other casino favorites here as well, meaning you don’t have to spin to win. Plus there is an absolutely massive bonus offer from Spinit Casino; as you might expect from a thrusting new casino looking to attract new players. This is an online casino on the way up, and more established names had better pay close attention to this new kid on the block. Spinit Casino is owned by a company called Genesist Global Limited, the group that is also behind the Casino Cruise site. Although the emphasis here is clearly on slot games, there are all sorts of casino table games and live dealer games to choose from as well. The site is licensed by the Malta Gaming Authority and the UKGC, meaning that it must abide by some strict gaming regulations regarding fairness and security. There are a lot of different games providers contributing to the site, to make for an entertaining gaming experience. This also removes the feeling of ‘saminess’ experienced at casinos powered by just one gaming provider. Any online casino which offers £/$/€1,000 plus 200 free spins to new joiners gets the thumbs up from us! Your first deposit is matched by 100% up to £200, and you get 200 free spins on Starburst along with it. Your second is a 50% match up to £/$/€200, your third deposit is matched by 25% to £/$/€300 and your fourth the same. The free spins are released in batches of 20 for the 10 consecutive days after you sign up. You need to wager your bonus x40 times to release, and same goes for free spins winnings. Other promotions on the site change weekly, but involve reload bonuses and cash-back offers, plus you can register to get special offers emailed to you as well. 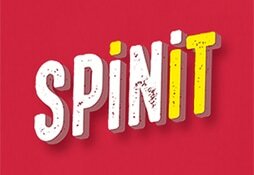 No money, no fun, and so Spinit Casino gives you plenty of options to deposit and (importantly!) withdraw your cash. Most prefer the option of Visa, Maestro or Mastercard on offer here, but these don’t work for everybody. Neteller and Skrill are present and correct as fast and easy electronic wallets. You’ve also got virtual Entropay cards as well as Paysafecard vouchers if you wish to use those methods. Other options are country specific and include Sofort, Eco, Trustly, Giropay and Zimpler. All withdrawals and deposits are processed in a timely manner, but you will be required to verify your account before withdrawing funds. When it comes to gaming options, this is where Spinit Casino really delivers. There are more than 1,200 games on offer here, and it is hard to find an online casino which can beat that kind of choice. Not just any old games either. We’re talking about games from top producers like NetEnt, Microgaming, Evolution, Aristocrat, NYX, Play ‘n Go and NextGen to name a few. So we know there is a great selection of slot games. What’s important to state is that there are also great video poker and table games options, including a live dealer selection that includes baccarat, roulette, blackjack and poker games. Customer support is available 24/7 to answer any questions you may have. You can get in touch via email, live chat or by dedicated phone numbers. An FAQ section will answer many of your queries without your even having to contact the site, but if you do you will receive professional and informed advice. There is also a VIP scheme for those high rolling ‘Spinners’, and you will be contacted directly should you qualify to join. For quality customer service and a secure and fair gaming environment, Spinit ticks all the boxes. Spinit Casino may be new to the market, but it is certainly making an impression. The light-hearted design and imagery used on the site emphasizes that this site is all about fun and games. And what a selection of games there is! With over 1,200 to choose from this may well be the only online casino you ever need to know. Throw in an extravagant opening bonus and there is a lot to like about The Spinit Casino. Plus you can add in great customer support and a reputation for security and fair play. The mobile version of the site is a big pull factor too, since this casino is easy to use on any smartphone or tablet. If you are a fan of slot games – or just online casino gaming in general – there are a whole lot of reasons to spin with Spinit Casino. Please refer to the T&C of Spinit Casino if you wish to learn more.